Fantasy Flight Games continues to release Star Wars miniatures for their skirmish game, Imperial Assault. And as often as they release 'em, I'm compelled by a deep, salmon-spawning instinct to paint 'em. They could release a dollop of burning plastic, and I would have to paint it up. 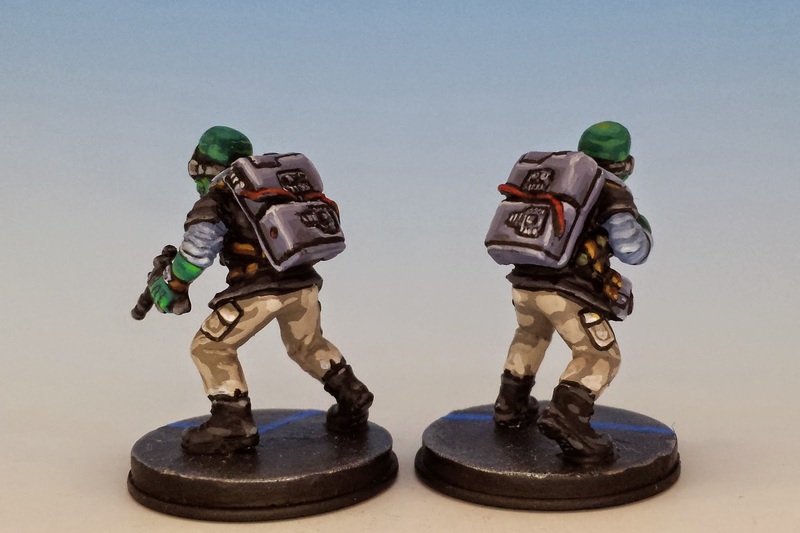 Lucky for me, the Imperial Assault sculptures seem to be getting better and better, with little touches that add a lot of character. 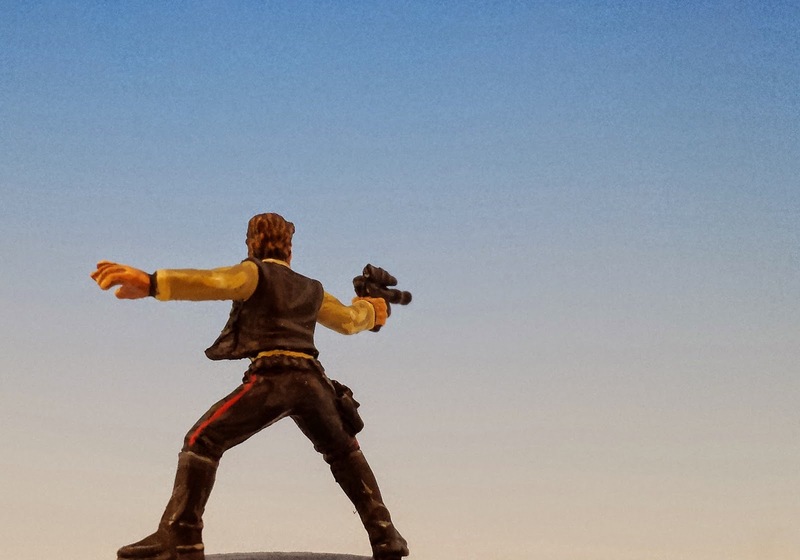 So, for example, this model of Han Solo (from the "Han Solo Ally Pack") is transformed by one simple detail: the corner of his vest flares out, giving us the feeling that he's just whipped his body around to face a new threat. A thoughtful person painting Han Solo is faced with an insoluble dilemma. Do I paint the hideous yellow shirt that he wore in A New Hope? Or the crisp white one that he wore in Empire Strikes Back? If you are indifferent on this issue, then ask yourself why you are reading this blog in the first place. 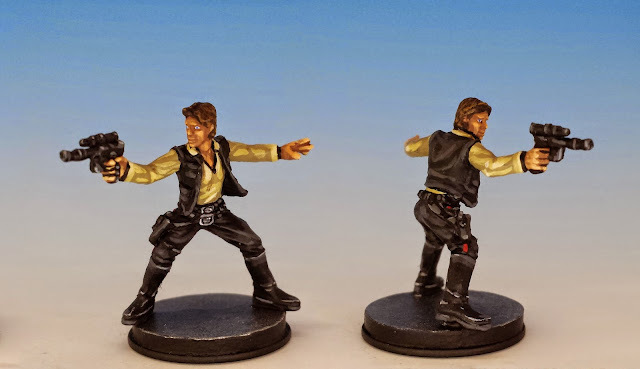 Ultimately, I opted for authenticity -- this miniature looks like the younger Han, a man unafraid to commit crimes against both the Empire and fashion. Chewbacca turned out to be a surprisingly difficult miniature to paint. This is because his fur is not a uniform brown, like Cousin Itt. 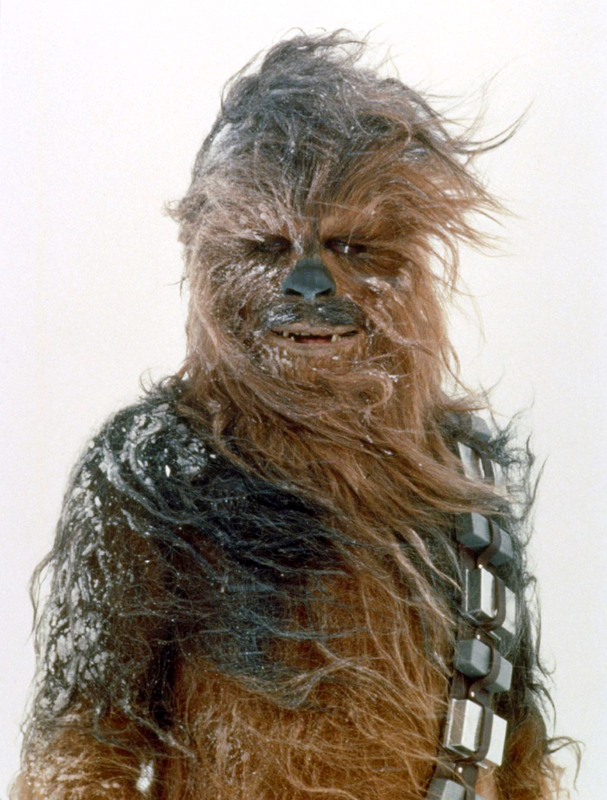 Instead, the more I looked at Chewie, the more I realized that his pelt was a complex mass of colours. His face is a chestnut brown, but the top of his head is streaked with black as if he combs it with Brillo. And the fur under his arms is graying. Finally, his upper lip seems to sport a dark mustache. Painting these variations without letting them get out of control was a real challenge. In any case, I like this sculpture -- it has a nice sense of movement. It breaks my heart that since the game is set right before The Empire Strikes Back, we are unlikely to see a miniature of Obi-wan Kenobi. I may have to brew up my own, if I can find a decent figure to convert. If any of you have any suggestions, I'd love to hear them. 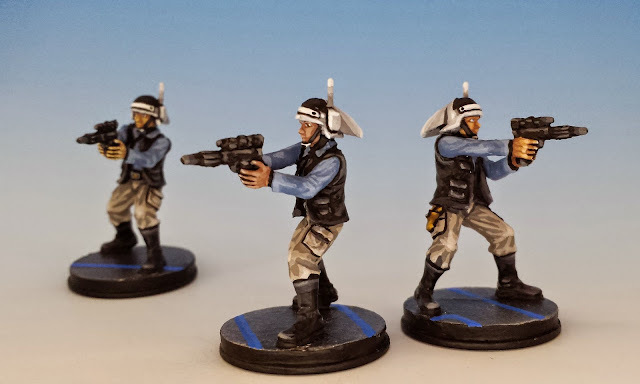 On the upside, Fantasy Flight has released some excellent models of the Rebel Troopers. These hapless soldiers are the first people you see when watching A New Hope. They (and their big hats) symbolize an insurgency that can't stand up to the power of Darth Vader and his Stormtroopers. I still can't look at them without wanting to bellow, "If this is a consular ship, where is the ambassador?!" Another interesting Ally Pack is the Rebel Saboteurs. 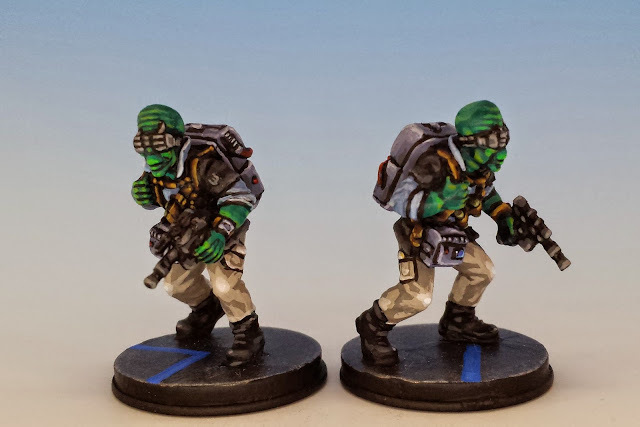 These green aliens are Duros, although their big red eyes are hidden behind some sort of night vision goggles. These visors are another lovely detail -- they look like something as much from Dune as from Star Wars. I painted these Duros with the same palette as the Rebel Troopers (buff trousers, blue shirts, black vests and boots) because I'd like my Rebels to have a consistent look. It drives me crazy that Fantasy Flight has not yet announced a miniature for Princess Leia. Having miniatures of Luke, Han and Chewie (not to mention the soon-to-be-released C3-PO and R2-D2), but no Princess is maddening. Leia's sarcasm was the only subversive part of A New Hope. A game without her is missing a vital spice. And aren't women an important part of the gaming market? Besides, don't they know how good she'd look with a cocked sporting blaster? Is it hot in here? Nice, what scale are these? Never seen any in the flesh. By my best guess, they're about 32mm scale. I see them as part of the gradual scale creep from 25mm to 28mm to "heroic" 28mm to "screw-it-these-are-big" 32mm. The highlights in clothes looks like cammo. And eyes are painted with a black cape on the sockets first. I especially like how you've brought chewie to life, the highlights on his bowcaster look great as well. Your work as always is impressive, most impressive. The wizards of the coast Bens are pretty good, you won't get a better match. Well done. The variations on Chewie's fur are quite effective. Your style seems especially suited to painting the metal bits. Blasters/visors/packs all look great. I just read this and wish I hadn't. Another line of minis (gamepieces) to add to the mountain. Really nice. I'll be painting my Han and Chewie soon, I love yours.